While often remembered as the founder of Gordon College, Adoniram Judson (A. J.) Gordon was more widely recognized for his work as the longtime pastor of Boston’s Clarendon St. Church—a position that required him to be experienced in the art of rhetoric. To honor his legacy as a speaker, the Communication Arts Department held its first annual JUD Talks speech competition over Founder’s Weekend—“Jud” being short for Judson, A. J.’s middle name. 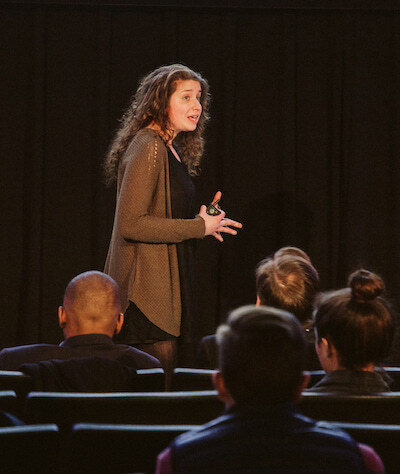 Six students were selected out of a pool of applicants to give eight-to-ten-minute TED Talk-style speeches that inspired or motivated the Gordon College community. Competing for a cash prize, Jackie Petrocelli ’18 shared how she learned that failure is not fatal, while Rebekah Stauffer ’19 implored the audience to see the value of resting on the Sabbath. To provide light-hearted transitions and entertaining introductions, Stephen Fung ’18 and Arwen Struthers ’21 served as co-hosts for the event. Judging the competition was Julia Spruance ’11, who recently gave a TEDx talk titled: “High Expectations” about co-leading the first trip of local children with disabilities up Kilimanjaro. Joining her as judges were Bersley Chery ’16, a communication arts alum who is now a business generation representative at Pegasystems, and Kirby Francis, a former communication arts adjunct in public speaking. With a lively and engaging talk entitled “You Are Not Stressed,” Sarah Petrillo ’20 (kinesiology) took first place ($300 in prize money) and the Peoples’ Choice Award, which was determined by polling the audience. Beginning her eight minutes with two friends joining her on stage—one cheerfully jogging while the other rubbed his temple as he hunched over a text book—Petrillo launched into her address noting that the girl who looked happy and was exercising was actually the one who was stressed, and that her other friend, the one studying, was anxious. She argued that we need to reframe our ideas of what is stress and distinguish it from anxiety. Weaving together her knowledge as a kinesiology major and her experience as a student, Petrillo detailed the negative effects that both stress and anxiety have on the body over long periods of time. Her animated and thorough talk concluded the afternoon and won over both the judges and the audience.